BOXING LEDGER | LATEST BOXING BLOGS | BOXING ARTICLES | BOXING BLOG FIGHT: Undercard Announced for July 16th Judah – Santa Cruz, Prudential Center, Newark, N.J.
Undercard Announced for July 16th Judah – Santa Cruz, Prudential Center, Newark, N.J. 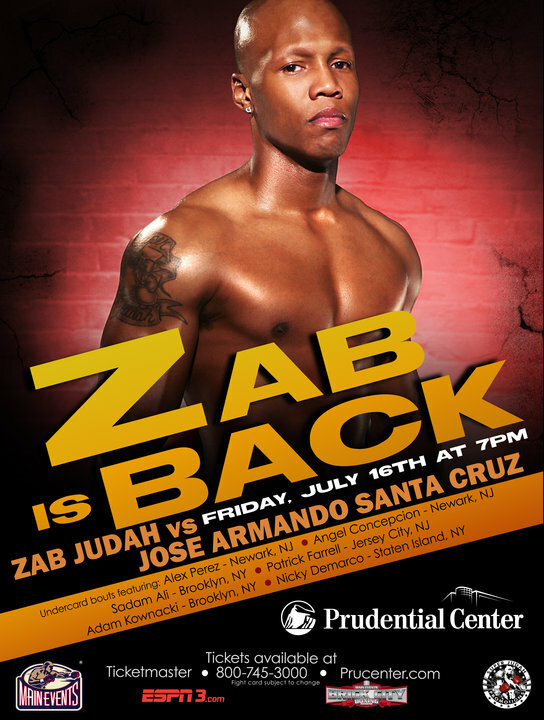 The undercard for the July 16th Zab “Super” Judah vs. Jose Armando Santa Cruz is shaping up to be a true boxing fan’s treat with abundant local flavor. The main event featuring Zab Judah, Brooklyn, NY 38-6, 26 KO’s vs. Jose Armando Santa Cruz, Michoacán, Mexico, 28-4, 17 KO will be a 10 round junior welterweight crowd pleaser. Zab promised that the match up will be full of action and excitement and that he has a few surprises in store for the fans. On the undercard, undefeated welterweight, Alex Perez of Newark, NJ, 11-0, 7 KO’s will bring exciting local action to Prudential Center as he takes on New York City’s, Vincent Arroyo, 10-1, 7 KO’s. These are two excellent welterweight prospects that have trouble getting matches and have decided to fight each other in a true crossroads fight. In his last bout, Arroyo upset Paterson’s Jeremy Bryan. In his second appearance at Prudential Center, Brooklyn, NY’s, Sadam “Worldkid” Ali, 7-0, 3 KO’s, will defend his unblemished record when he takes on Philadelphia’s, Julius Edmonds, 7-7, in a 6 round welterweight battle. In his last fight at Pru Center Ali thrilled the large number of fans who came to cheer him by scoring a unanimous decision 4 round decision against Jason Thompson. Patrick Farrell, 5-1, 3 KO’s of Jersey City always brings a big crowd of supportive, boisterous fans when he fights near his hometown. He will fight a cruiserweight match against Newton “The Butcher” Kidd, Bronx, NY 7-7-1. Polish fans will be pleased to see that a local “Pole” will also be featured on this card. Heavyweight, Adam Kownacki of Brooklyn, NY, 3-0, 3 KO’s, will try to keep the red and white spirit prevailing at “The Rock” as he takes on Damian Clement, of Dayton, Ohio. Still craving more local flavor? Nicky DeMarco, 2-2, 2 KO’s, will draw his fans from Staten Island across the river to witness his 4 Round rematch against the Bronx’s Jose Guzman, 5-7-1, who intends to bring a boisterous contingency of his own. In their last meeting DeMarco lost a 4 round decision to Guzman. Newark’s Angel Concepcion, 1-0, will try to better his record in front of his hometown crowd when he takes on Light Heavyweight, Shannon Anderson of Coatesville, PA, 4-1, 2KO’s. Tickets priced at $53, $78, $103 and $203 (ringside) can be purchased at Prudential Center Box Office, by calling TicketMaster at 800-745-3000 or www.Prucenter.com.